Starring: John Goodman, Mary Elizabeth Winstead, John Gallagher Jr., and more. ’10 Cloverfield Lane’ took the film world by storm much like the monster/alien did in the film of ‘Cloverfield’ eight years ago. No one expected it and no one knew anything about it until it made its presence known. In one of the most secretive releases in film history, this has quickly become a much anticipated film of the 2016 year. On the flip-side of things, it is also one of the most creative marketing plans ever done in film history as well… Today is the pre-release day for ’10 Cloverfield Lane’ (3/10/2016) and it is time to see if the unexpected sci-fi thriller can impress and surprise crowds as much as the first one did back in 2008. Out of the gate, we follow Michelle (Mary Elizabeth Winstead) as she is seemingly escaping her life for unknown reasons and begins to drive to an un-explained location. As Michelle continues her lone getaway drive, an unforeseen accident lands her off the road and in peril. Moments later, Michelle is no longer in danger but resting on a mattress hooked up to a makeshift IV. Confused to her situation, Michelle examines the room until our next character makes his appearance, Howard (John Goodman). He makes sure to tell Michelle that she is safe and that he is keeping her alive but she remains skeptical of his motives and makes attempts to escape her holding area until she understands the scenario Howard is trying to explain to her; that the world outside of their location is no longer the world she used to know… As the film proceeds, Michelle meets another individual within Howard’s protection, Emmett (John Gallagher Jr.) who also believes in what Howard says in the means of the world not being a safe place to be anymore. Between the three, there are moments of defiance and moments of understanding but Michelle continues to stay driven on her personal mission of leaving her confines and exploring the truth of what is actually happening in the world beyond what Howard tells her. When ‘Cloverfield’ came out in 2008, I personally was not a fan at all. I hated the camera work, still hate T.J. Miller (Sorry not sorry), and overall I just did not understand it. 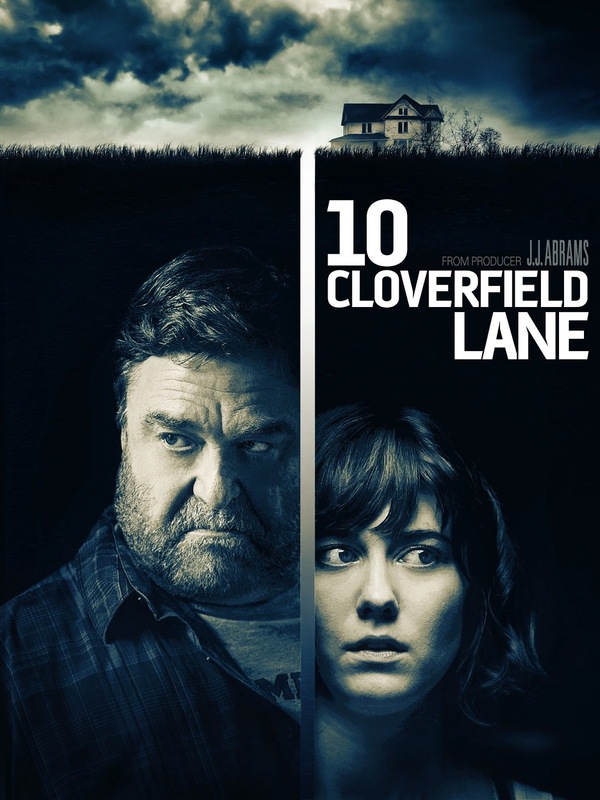 However, after viewing ’10 Cloverfield Lane’ and seeing the (possible) connections to the first one; I now have a new-found appreciation for ‘Cloverfield’ as I have a love for ’10 Cloverfield Lane’. So now where do I begin? We will start at the beginning. 1. The introduction of the title and the directors and producers was fantastically creative to me. All I will reveal for this part is that when the introductions are occurring, it is during the car crash scene as I previously explained in the summary. 2. The straight up unexpected turns and shocking moments keep happening throughout the entire film. As you think or witness one thing, another turn happens to alter the expected timeline every time. 3. John Goodman is eerily creepy, frightening, and fantastic all at the same time. There are moments where you want to love him, want to respect him, then want to see his brains splattered across the confined walls. Regardless, Goodman puts on a show in this one and is wildly effective in regards to the thriller element of this film. 4. and last point, ’10 Cloverfield Lane’ is a barrage of “WTF” moments and curiosity but in the best way possible. Why is this happening? Who is Howard exactly? What is exactly happening? How much time has transpired since the events of ‘Cloverfield’? ’10 Cloverfield Lane’ is playing curiosity perfectly by enticing crowds to take interest in the film and keep them wondering afterward and wanting more. I applaud Abrams and company and I personally am looking forward to the next installment desperately. They created an enticing sci-fi/thriller/mystery/drama all in one mysterious punch and I want more. Check this one out ASAP people if you loved the first Cloverfield or if you just simply love this style. To whom it may concern: Just to clear the waters, this installment IS NOT a direct sequel to ‘Cloverfield’. It is the same universe but it is not a direct sequel. I stated that there may be possible connections. Regardless, it is a fantastic stand-alone film and I am anxious to see how things may tie together by the time Abrams is green-lit for another installment. Posted in Movie Review, Uncategorized.